Circle layers are used to represent circles =). A circle is the flat region defined by the inner area of a circle. A circle is a flat line on which all the points are at the same distance from the center or Origin. The distance to the center is called "Radius". 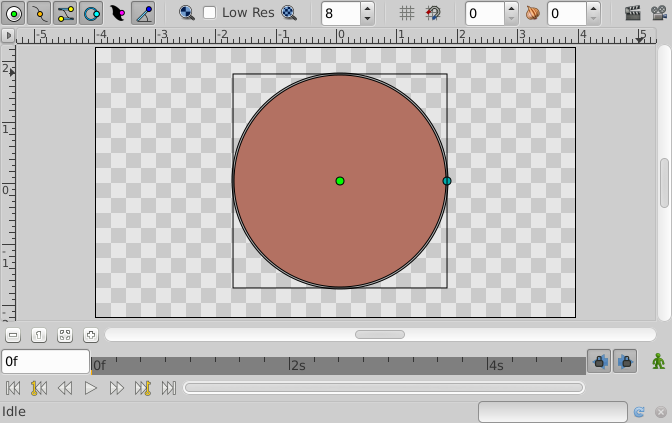 To create a "Circle Layer" you would use the Circle Tool. Make a first left mouse button click where the Origin should go and hold-drag from the center to define the Radius when you release the left mouse button. The circle will be created with the current foreground Color. Some of the parameters of Circle Layers are common parameter that are shared for several types of Layers. Click on the links to see their definitions. Only the particular parameters for the Circle Layers are described here. As mentioned before is is the radius of the geometric circle or circumference. It is modified dragging the cyan handle at the edge of the circumference. Although you rotate it it always becomes horizontal. It is a parameter type vector that defines the center of the circle/circumference. Just edit its x,y coordinates or drag the green handle to change this value.